Photo shared from I Love Alaska Facebook Page. Photo by Jordan Alleva. Cheers to the last day of 2015! It’s been a pretty magical year on The Kenai, Alaska’s Playground. So in honor of the final day of the year, we though we’d do a little “Throwback Thursday” and recap the most memorable moments from our Facebook page. Kenai Lake. Photo from Ed Boudreau. Shared with almost 35,000 fans of the glorious Kenai Peninsula, let’s kick this party off with this Photo #1; A stunning sunrise in Seward, Alaska shared from Sunny Cove Sea Kayaking. Photo #2, perfectly captioned “Eagle Eyes” is shared from the beautiful town of Seldovia, Alaska. Photo #3 is a pretty in pink glorious morning sunrise shot from the beautiful town of Seward, Alaska. Photo by Katherine “Pinky” Bleth & the Seward Journal. Photo Credit: Daniel Leifheit. http://bit.ly/1C8YuOL. Photo shared from I Love Alaska Facebook page. The #6 most popular moment on The Kenai, Alaska’s Playground featured an epic underwater chase by a school of halibut chasing a GoPro. Check out this link HERE to view the full video. Warning: it’s up close & personal and incredibly AWESOME. #7 is the true epitome of “the land of the midnight sun.” This blue-bird-sky photo was taken in June at midnight on the beautiful Turnagain Arm. Photo by Brittney Robles. Shared from I Love Alaska Facebook page. Photo shared from The Alaska Life Facebook page. The #9 moment features a video of a giant pod of humpback whales that put on quite the show during a Kenai Fjords Tours excursion. If you turn up the volume, you can actually hear the whales trumpet. Once in a lifetime memories happen on Alaska’s Playground! Video featured HERE! Photo from Kenai Fjords Tours Facebook page. Moment #10 is a lovely video of an Orca rubbing its belly along the shore of Fox Island Alaska. Full video HERE! Video from Eric Eberspeaker. Photo from Kenai Fjords Tours. Our #11 moment features an Aurora Borealis (Northern Lights) time lapse from Lights Out Photography that is comprised of 546 images taken in the span of about 18 minutes. Exposure time for images were 2 seconds. Shot from the Seward Hwy. Check out the full video HERE! Aurora Borealis photo from Lights Out Photography. #12 is a fan favorite and a seasonal delight. Fall colors on the Seward Hwy. Our fall season is short here in Alaska, but boy oh boy does it leave a lasting impression. Photo from the Seward Highway. Moment #13 is appropriately titled “just another day in Alaska.” In this incredible video captured by Bill Tyra you see two bull moose rutting and rumbling it out right smack dab in the middle of a residential neighborhood in someone’s driveway. It’s incredible. And its real. Only in Alaska! Full video HERE. 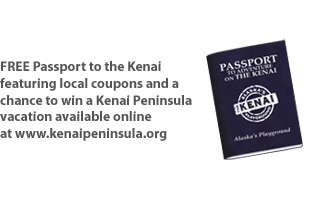 #14: Surrounded by nature, the small town of Kenai, Alaska stirs peacefully. If you’re wondering, the answer is “yes, we pinch ourselves daily in amazement that this is our backyard.” Lucky is an understatement. Photo Credit Greg Daniels. Shared from the Kenai Visitors & Cultural Center. And last but certainly not least, moment #15 of the Year 2015 is this beautiful winter shot featuring the vivid Aurora Borealis captured sky-high from the chair lifts. Photo shared from Alaska Dispatch News. Whew! What an amazing year it has been. And the best part is that every year seems to get even better than the last. So hold on tight, 2016 is going to be epic! We can’t wait to share our journey with you and most importantly, we can’t wait for you to share your new memories with US! Thank you for joining us in celebrating all things glorious on the Kenai Peninsula year after year. We are blessed to share our love for this beautiful place with such wonderful people. Cheers!